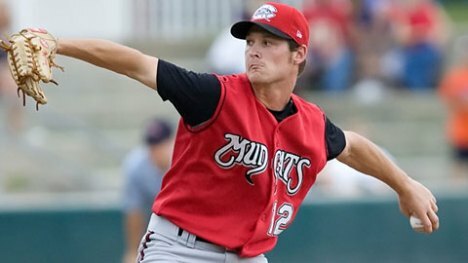 Travis Wood took a huge step forward in 2009, establishing himself as one of the best lefthanded pitching prospects in all of the minor leagues. "It's not uncommon for young prospects to struggle in their first taste of double-A ball. The competition level is a significant jump from high-A ball, so an adjustment period is only natural. However, Wood will have to demonstrate a better curveball if he is going to find success at double-A. The higher he climbs the ladder, the more varied his repertoire will have to be. He'll need to improve his polish on the breaking ball and maintain the 88-91 mph velocity on his fastball to compliment his stellar change-up, as pitchers have a much more difficult time finding success at the upper level by relying heavily on just one pitch. It won't take long in 2009 for Wood to reveal whether his 2008 struggles at double-A were the standard struggles of a young prospect or symptomatic of his inability to command an effective breaking ball. Travis Wood still wields the best change-up in the system, but he'll need to show more than that to find success at double-A next year. For now, he checks in at #19 on the list." The 2009 season was obviously going to be a significant data point for Wood and, fortunately, it didn't take him long to establish that his true level of performance was substantially higher than he demonstrated in 2008. At the time, I thought his success was going to be driven by improvements in his curveball. He already had a plus change-up and a solid fastball, but to be an effective starting pitcher he was going to need a third pitch, a breaking ball, to change the hitter's eye level and give him an additional arrow in his quiver. Of course, Wood's breakthrough to a new performance level actually came about by basically putting the curveball on the back burner. Instead of improving it, he went in an entirely different direction. In its place, he installed a shiny new cutter, which gave him a very effective third offering. Prior to the introduction of the cutter, Wood struggled to keep righthanded hitters from diving out over the plate to attack his fastball and change-up. He had a good fastball and a change-up with late fade, but the introduction of the cutter gave him a pitch to keep righthanded hitters honest. The addition of the cutter gave Wood offspeed pitches that move in each lateral direction. Instead of only having pitches that are straight or fade away from righties, the cutter enabled Wood to attack righthanded hitters with a pitch that broke in on their hands. The addition of the cutter enabled Wood to effectively work both sides of the plate and attack both left and right handed hitters. In 2009, Wood was remarkable over two different levels. He started out in double-A Carolina, where he posted a 1.21 ERA, 0.97 WHIP, and 103/37 K/BB ratio in 119.0 innings and 19 starts. He had strong ratios, including a 2.8 BB/9 and a 7.8 K/9, which is a nice blend of power and control. His ERA was ridiculous and probably a touch lucky, as he boasted a .246 BABIP, 2.65 FIP, and most alarmingly an 82.8% strand rate. If ever a performance warranted a promotion, it was Wood's. And, the Reds promoted him to triple-A Louisville to finish out the season. For Louisville, Wood posted a 3.14 ERA, 1.21 WHIP, and a 32/16 K/BB ratio. His ratios weren't quite as strong as they were in double-A, as evidenced by his 5.9 K/9 and 3.0 BB/9. His component stats regressed somewhat, as seen in his .273 BABIP, 3.96 FIP, and 79% strand rate. Wood was one of the minor league leaders in ERA throughout the season, which was impressive given the large sample size, but also probably unsustainable in light of his overblown strand rate. Wood stranded runners at a much higher rate than is to be expected. Even so, it was a massive step forward for Wood who also managed to log a career high of 167.2 innings pitched. Unfortunately, Wood has neutral flyball/groundball tendencies, as evidenced by his 0.98 GB/FB ratio in 2009. Obviously, he would benefit by generating more groundballs in Great American Ballpark, but he may not have the repertoire to do it. Wood still possesses the best change-up in the system, but his fastball velocity has never returned to the consistent 93-94 mph it attained in high school and his breaking ball continues to be inconsistent. His fastball sits in the 88-91 mph range, which should be sufficient for a southpaw to be successful at the highest level. Wood is still trying to refine his curveball, which can roll and stay up coming out of his hand. That said, Wood does possess a top notch change-up, which is one of the best weapons a pitcher can possess. The change-up is a true pitcher's pitch and one that fewer pitchers actually master than one might expect. It's one thing for a pitcher to succeed just by reaching back and cutting a good fastball loose, but it's an entirely other thing for a pitcher to succeed by changing speeds and hitting his spots. The former is typically a thrower, while the latter is a pitcher. Wood features a circle-change that breaks down and away from right-handed hitters, which may make it a nice weapon for combating a heavy platoon split. And, of course, the newest addition to his arsenal is the biting cutter that he can command effectively inside the strikezone. Wood possesses good, clean mechanics. His wind-up is carried out at a faster tempo than average, but it's not a concern because he manages to keep his body in sync. Here are some frames of his wind-up courtesy of "mwlguide:"
In frame 4, you can see the nice high leg kick, the good body coil, the toe pointed to the ground, and how he has effectively created energy while maintaining his body over his plant leg. Note back in frame 3 how the line of his hips runs basically from 2nd base to home plate, while in frame 4 the line of his hips runs almost from 3rd base to 1st base. The high leg kick and coiling of the body enables him to store up energy to later impart on the baseball. In frame 5, he has already broken his hands and started driving to the plate. He is hiding the ball well, which increases his deception as it increases the difficulty of the hitter in picking up the baseball. In frame 6, he has driven off the mound and released the pitch. He gets good extension in his arm action. He hasn't thrown against a stiff leg, which allows in frame 7 for his upper body to finish over his glove side leg. His body is squared up and he finishes in good fielding position. Overall, as you can see, Wood has smooth and efficient mechanics. A few things that jump out at me in this video. First, the video better illustrates how he coils his leg kick to create potential energy. Second, his arm action is very smooth and easy. He's not a max effort pitcher and his arm action isn't herky-jerky. Finally, his body control is strong. He has good balance and never seems out of sync, as evidenced by his consistently strong finishing position. One potential cause for concern, however, is Wood's slight build. He's only 5-11 and weighs in at 166 lbs. Given his height, he is not going to be able to pitch on a downward plane, which isn't ideal because his fastball only sits in the 88-91 mph range as it is. So, he may have to work harder to maintain acceptable velocity. It may benefit Wood to add more strength to his lower body, as that may help take some strain off of his arm and potential give him a tick or two more velocity on his fastball. The best and most efficient pitchers throw with their entire body, not just their arm. While Wood does a nice job coiling up his body and driving off the mound, increased lower body strength may lower his risk of an arm injury. Travis Wood took a big step forward in 2009 and his emergence gives the Reds a stable of quality pitching prospects that they have had in as long as I can remember. He lost out in the Spring Training battle for the 5th spot in the rotation to Mike Leake, so he'll head back to triple-A in hopes of winning a role in the majors. Ultimately, Aaron Harang and Bronson Arroyo are likely finishing up their respective Reds careers, as both contracts expire after the 2010 season. The Reds hold a team option of $12.75M on Harang and $11M on Arroyo, but given their mediocrity and the wealth of cost-effective young pitching, it's difficult to imagine the team exercising either option. Overall, the addition of the cut-fastball has made Wood a much more intriguing and legitimate pitching prospect. It remains to be seen if he has "enough stuff" to succeed at the MLB level, but a bit more development time should help him continue polishing his skills. As of now, many scouts still view Wood as having a ceiling of only a #4/5 starter, despite his awesome numbers in 2009. Regardless, Wood continues to strive to get better, as he spent the offseason working out with fellow Arkansas native Cliff Lee, which may have given Wood an extra boost of confidence and a greater understanding of what it takes to succeed at the highest level. Wood called Lee a "mentor" and he'd be hard pressed to find a better one. The Reds haven't had an effective southpaw in the MLB rotation in quite a while, but Wood and Chapman will be looking to change that in the near future. Wood's cutter and stellar 2009 season are enough to land him at #4 on the list. I've always appreciated Wood's change-up and mechanics, but it's the cutter that could make all the difference for him. i think once he lost the spring training job, he might be blocked for good in the rotation, good depth to have though. Yeah, when I was first looking to see how Wood fit into the future plans, I wondered if he would be left without a chair when the music stops. Still, I think there could be room for him. Depending on what we do with Harang and Arroyo. I think the real question is when will our young pitchers step it up? Seriously, Cueto sliced through the minors like a hot knife through butter. Homer came with more hype than any pitcher in the system in recent memory. Still, hasn't lived up to it yet. Of course, Edinson blew out his elbow and Leake skipped the minors entirely. So, we have a ton of young pitching, but none of it is really pitching at the level we expected. So, I think, at least in theory, there could be room for Wood. If a couple of guys step up, that could be the most cost effective rotation in the majors. In a funny way, Wood may only fit in the rotation if the younger guys step up this year. If not, then we may be tempted to exercise the options of Arroyo or Harang. If that happens, then Wood may wither on the vine in the minors. As for the big trade, I'm not so sure. If we are in contention, then it'll be difficult to part with any established vets. And, I'm not sure I see us parting with young talent and adding payroll if we are in contention. Still, it might be fun to be buyers at the deadline for once. i think we could kind of be a buyer and seller. If Volquez comes back early, chapman/wood or someone like buck/ravin/thompson start domintating and move fast then you could trade one of arroyo/harang and clear some money for a big trade. btw you left leake out of your rotation, do you not think he can stick in the bigs? Off topic here, just wanted to know how you think of Henry Rodriguez. He played short last year for GCL but has been moved to second because hes blocked by DD. I love his plate aproch, he hardly walks but also strikes out at an extremly low rate. he has yet to do either this year so far and has showed very nice power in the early goings. whats your opinion on him? Gotta admit, it was late and I clearly wasn't mentally sharp. I just completely forgot Leake. Obviously, he's in the mix for a rotation spot. In fact, his higher floor and lower ceiling makes it very likely that he'll claim one of those spots. I'm not entirely how it'll all shake out. I will say that I'd like to see our young pitchers actually pitch up to their respective ceilings. Cueto and Bailey still aren't doing what has long been expected of them. We'll have to wait and see how strongly Edinson bounces back from TJ. It's becoming fairly routine, but not everyone makes it back. So, we do have a lot of talent, but very likely not all of it will pan out or stay healthy. I like Wood and the fact that he throws from the leftside works to his advantage. It's nice to have both upside and depth. If a couple of them step it up, then we could see all 5 rotation slots filled from within. To be honest, it's tough for me to form a definitive opinion on guys like Henry Rodriguez until they rack up a bit more experience in the minor leagues. But, my first impression of him is good. I'm not overly impressed with his plate approach, but I always tend to favor late count hitters. You can avoid strikeouts and walks by forcing an early consequence to the AB. Still, I'd rather have both the walks and whiffs than neither of them. That said, it's not too surprising or unusual to see such an aggressive approach out of a young prospect. I will say, I AM impressed by his power, especially for a guy who stands 5-10 and tips the scales at 150 lbs. He does seem to have better than average ability to drive the ball for a young middle infield prospect. So, that is rather encouraging. He's also off to a very quick start from a power standpoint for Dayton with 2 homers. Still, that comes along with a batting average (.333) that is actually higher than his OBP (.321), which is fairly rare. For the Gulf Coast League, he hit .319/.349/.403/.762. Not too shabby. Still, his line drive rate was only 13.4% and he hit a lot of balls on the ground (56.7%). He's definitely on my radar and I'm intrigued to see what he can do in 2010 at Dayton. I like the power I see at such a young age, but I do have concerns about his plate approach. Still, at a "defense-first" position, he can get away with an aggressive, early count plate approach. Also, not sure how much physical projection and offensive upside he really has to his game. Lark, you really should put Matt Fairel somewhere on this list. I love your site and all, I mean its really incredible, but have you seen Matt Fairel's numbers? He is also only 22, his fastball touches 94, he has a great curveball, and he has a sick strikeout rate. I would have put him around 17 on my list. I definitely considered Fairel, as he brings some good things to the table. My concerns with him were whether he had enough "stuff" to succeed at the higher levels. He's a polished collegiate lefty out of FSU who has had good success at low-A and high-A. So, there are also "age vs. level" considerations at work. For me, Fairel landed in the 26-30 range. I just needed to see him perform well against more advanced competition before I really got excited. I actually have a feeling that he may do just that. He's definitely intriguing and could move quickly up the ranks, but he was one of the guys who just missed the cut. Hi Lark.Great job on this evaluation.I was wondering if you were a professional scout. Thanks for the kind words. To answer your question, no, I'm not a professional scout. However, I love all things baseball and have a tremendous amount of respect for scouts and the scouting process. In that spirit, I have been able to talk to a scout or two about how they do what they do and I have studied the scouting process rather extensively. I enjoy trying to find diamonds in the rough, so I like to try my hand at evaluating prospects. It's certainly not an easy process, but it is fun.